RIT students, from left to right, Alex Bogart, Tom Smith, Norman Greenberg, Douglas Mansell and Samuel Sternklar, developed the card game Hexes! !, which has been named a top selection in Hasbro’s “Next Great Game” contest. Five Rochester Institute of Technology students have their eyes on the prize—the top prize for the Hasbro Gaming Lab and Indiegogo “Next Great Game” contest, that is. And at this point, victory could be in the hands of their crowdfunding contributors. Four game design and development students—Douglas Mansell, Norman Greenberg, Tom Smith and Samuel Sternklar—and Alex Bogart, a software engineering student, have created a game prototype called Hexes! !, The Card Game, named by Hasbro as one of the top five out of 500 game submissions from across the country. Achieving their $6,000 goal on the crowdfunding site Indiegogo as part of the contest will cover the cost of producing the game and advance them to the next round of the contest. According to Hasbro, the winner will be selected based on the concepts’ gameplay mechanics, theme, potential for ‘fun-ness’ and viability. The grand prize is $10,000 and a trip to Hasbro’s global headquarters in Pawtucket, R.I., to develop the game. So fun, in fact, that Oyzon encouraged the team to submit its game to the national contest. Mansell, a fourth-year student from Salt Point, N.Y., is the team lead. While Greenberg, a third-year student from West Long Branch, N.J., and the team’s design lead, says that digital games are popular, he believes that face-to-face games are making a comeback. Hexes! 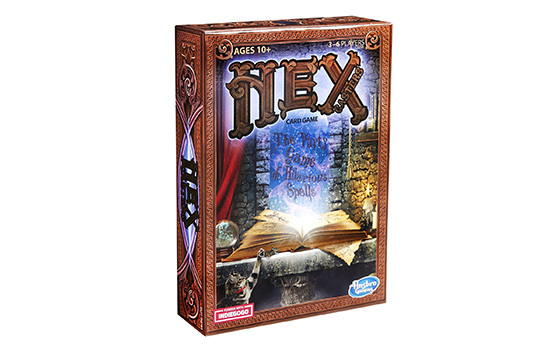 !, The Card Game is a fast-paced card game where players “hex” their friends with rules they must follow, such as stating silly cat facts, standing on one leg or referring to someone by a different name, throughout the game. Players remain in the game by following the rules on all the hexes they receive. If the rules are broken, the player is out. Mansell also said they chose to work with administrators in RIT’s Center for Media, Arts, Games, Interaction and Creativity (MAGIC) based on the center’s history of promoting successful crowd funding campaigns and their ability to bring industry polish and commercial scale and support to products. For more information about the game, go to the teams’ Facebook page: www.facebook.com/HexesCardGame/.